Pinterest is opening up its search advertising services through partnerships with brands that advertise through Kenshoo's marketing platform. 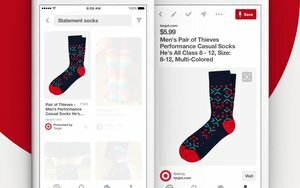 Since all results are visual,when searching on Pinterest, the social site created a method to use Google's content of Shopping Ads on its platform. The full suite of features on Search Ads on Pinterest includes Keyword and Shopping Campaigns that serve up in the platform's search results. The suite also offers new targeting and reporting options. An option to run product ads will show up as an option in Kenshoo's platform, which allows marketers to run search campaigns alongside Google, Bing and others. The features are being tested with brands such as Barilla, eBay, Garnier, Target, The Home Depot, and Walgreens. On Pinterest, search is now responsible for more on-site impressions than any other Pinner action, according to the company's internal analysis. Although the amount of searches pales in comparison to Google and Bing, Pinterest sees more than 2 billion searches per month, searching for details on the more than 75 billion Pins created by site visitors saving images. And most of those images are for products and services that people want to buy. Pinterest, which has begun to attract interest from consumers pursing other social sites, estimates that people start searching for products as much as three months before they make the purchase. Some 97% of search terms on Pinterest are unbranded, 42% say they use Pinterest instead of a standard search engine like Google or Bing, and 72% of those posting Pins say Pinterest has introduced them to a new brand or service. "Pinterest already has some of the best data on what users are passionate about and interested in," said Will Martin-Gill, chief strategy and development officer, Kenshoo. "Combining that with what somebody is actively interested in and looking for in a given session will create one of the most relevant opportunities to optimize online." Since the site was built for a visual experience, mobile search adapts well on the platform, with 52% of search clicks coming from smartphones during the fourth quarter in 2016, per data from Pinterest and Kenshoo. "In a blind study, Pinterest researchers found that many people start their searches broadly, with 64% preferring to start searches with a general idea, rather than specific search terms. Often, consumers don’t want objective answers; they want tools for subjective discovery," according to a white paper published Tuesday. The findings from Kenshoo highlight how search engines solve objective queries, such as where to buy an item or where to get the best price. Pinterest designed its search ads to do just that, find the best place to buy something for the best value. On Pinterest, "search is now responsible for more on-site impressions than any other Pinner action," according to the company's internal analysis.